Find details of our May walks on our events page. Badock's Wood covers an area of approximately 10 hectares. It is a small, semi-natural, broad-leaved woodland situated in a limestone valley (with adjacent areas of grassland) in the north-west of Bristol, between Henleaze and Southmead. It therefore provides a wildlife haven in an urban setting. To the north of the site, in an area of open grassland, is a Bronze Age burial mound (tumulus). The latter has been classified as "Middle Bronze Age, constructed about 1300BC" and is sometimes referred to as the "Southmead Round Barrow". The site has been in the care of Bristol City Council since 1937, when it was given to the City by a local industrialist, as an area of open space for the enjoyment of local people. The local industrialist was Sir Stanley Badock, hence the adoption of the name "Badock's Wood" for the site. He died in 1945. This large area of green space within the confines of the City is important to, and valued by, local people for many recreational purposes. In recent years various organisations have actively worked together to generally improve this important resource for the benefit of the local community and wildlife. The Friends of Badock's Wood (FOBW), in conjunction with Bristol City Parks, help by maintaining and improving the different habitats. 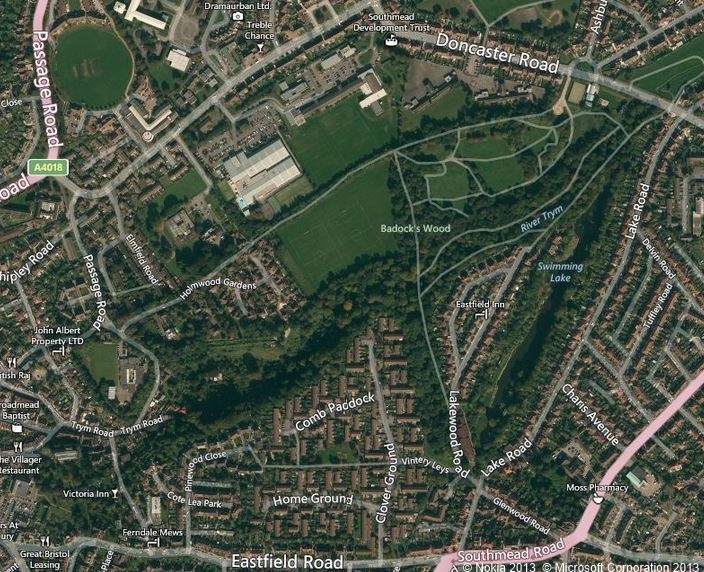 This includes improvement to the woodland and stream environment in respect of safety and access and also enabling it to be used for educational activities by the local communities, especially Southmead. Over time, additional facilities such as interpretation boards are being provided. FOBW also plan to raise awareness of the site and, in particular, the 3,500-year old Bronze Age burial mound. In consultation with English Nature, Badock's Wood was assessed and awarded the status of a Local Nature Reserve (LNR) in January 2008. Designation as an LNR recognises the importance of Badock's Wood both for wildlife and people. Although LNRs do not receive any legal protection, by declaring a site as an LNR the Local Authority is making a commitment to manage the land as a Nature Reserve and to protect it from inappropriate uses or development. Badock's Wood is surrounded to the north and east by Southmead, a designated Neighbourhood Renewal area that is eligible for Neighbourhood Renewal funding.